This is a picture I took in December, 2014 of the Sea of Galilee along the shoreline by Tabgha. 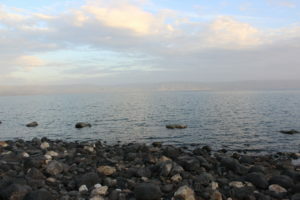 The Sea of Galilee is also known as the Sea of Tiberias and Lake Gennesaret. As the size of seas go, it seems that lake is a more apt description of its size. It was here in Galilee where the vast majority of Jesus’ ministry occurred. It is the lake the fishermen Peter, James and John would have fished. It was here on the beach (rocky, not sandy) where Jesus enjoyed a post resurrection breakfast with the disciples. (John 21:4-14). There is something special to me about being in historic places, especially those places connected to our faith. It is why I am looking forward to rejoining my Old Testament Professor Dr. Monte Luker as he leads another Holy Land Study Tour this December. Please let me know if there are any places and sites you would like photographed, and if the itinerary and circumstances allow, I’ll do my best to capture it.